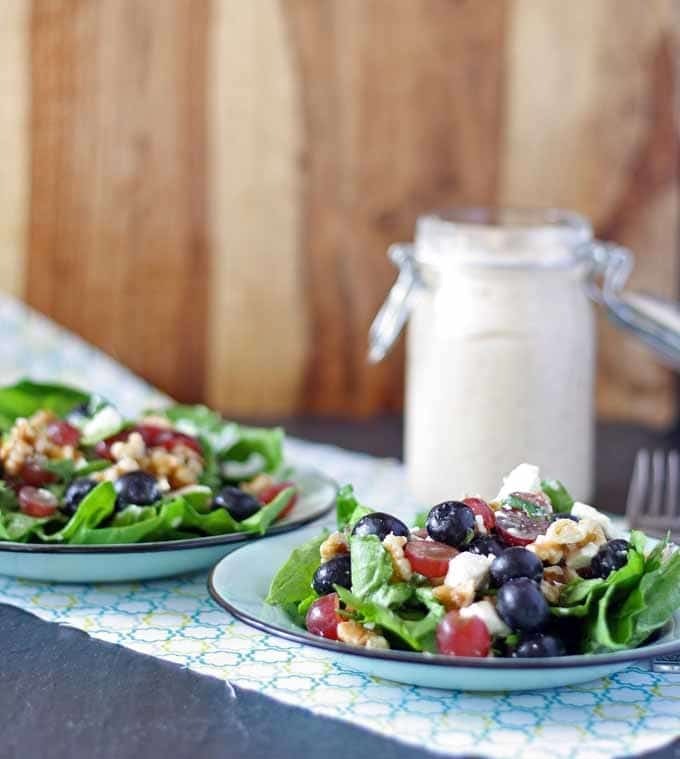 If you’re looking for a quick lunch salad, try this spinach salad with balsamic poppy seed dressing. It’s loaded with fruit, feta and walnuts! Sometimes life is a little crazy (or boring) and you just don’t want to cook. That’s where I was at this Thursday afternoon. It’s not a familiar feeling – I like being in the kitchen usually, experimenting over the stove top. It’s also not a nice feeling. I feel guilty every time I don’t want to cook – food blogging has done that to me. Even ordering takeout brings out a little of the Catholic guilt that was instilled into me as a kid. Hunger usually prevails and I have to make something to eat or starve. I went through the refrigerator and freezer, trying to figure out what I could make with what was on hand – bonus points for needing just a little bit of work. It was a tossup between a frozen pizza and this salad. One would require me to turn on the oven and the other would require some turning of a whisk. Whisking won out thanks to fresh ingredients versus frozen, and this recipe was born. I read somewhere once that you should have a colorful plate and you can’t get much more colorful than this salad. 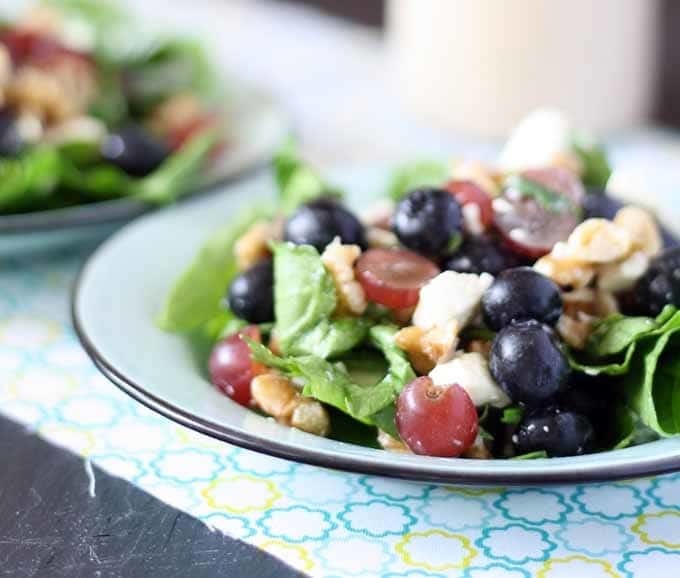 Brightness and color comes from the vibrant spinach leaves and grapes. 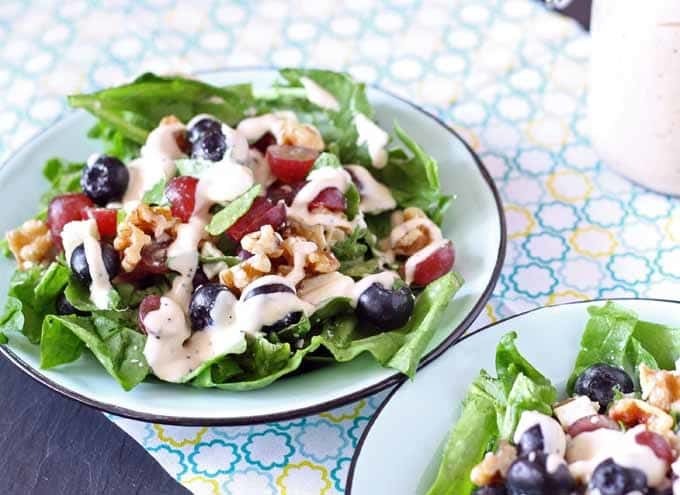 They are balanced out by the deep undertones of the blueberries and the neutral tones of the feta and walnuts. To top it all off is the balsamic poppy seed dressing and its so good you will want to eat it on its own. This recipe will make about 4 large salad portions – if you serve the salad without the dressing and then put the leftovers in the fridge, it shouldn’t get too wilty. Think leftovers, or maybe even stick it in your morning smoothy. If anyone tries the smoothie thing, let me know how it goes! 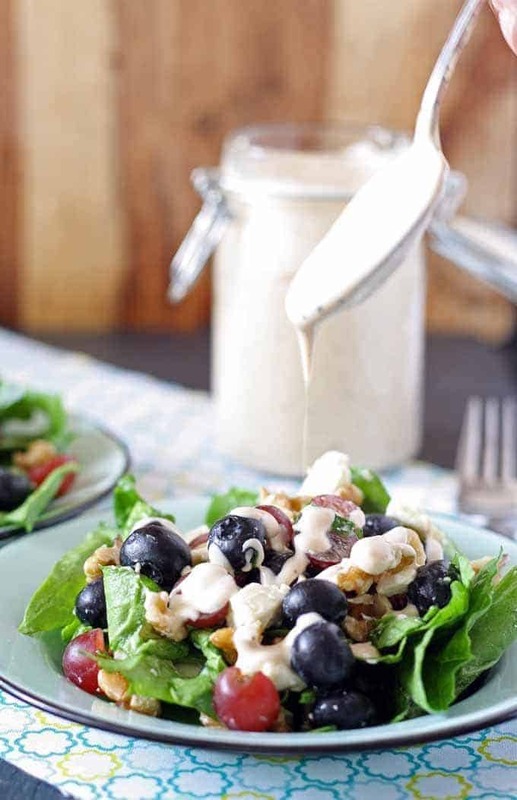 Depending on how much salad dressing you put on a salad, this recipe will make alot of dressing. 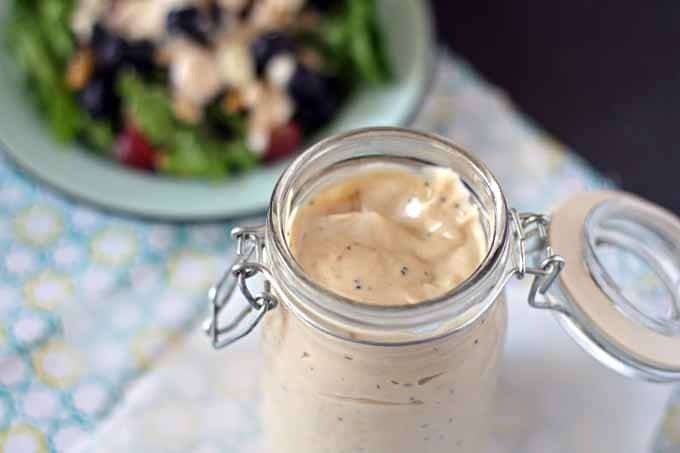 I drizzle the dressing or dip my fork into it, so there is a mason jar of leftovers sitting in the fridge. If you like your salad to swim, I still think there will be enough in one batch for you. Either way, if there are leftovers, fridge them! I’m making up verbs now. In a small bowl, combine all ingredients. Mix well with a wire whisk. If you'd like a thinner consistency, add water in 1/4 teaspoon increments until desired consistency is reached. 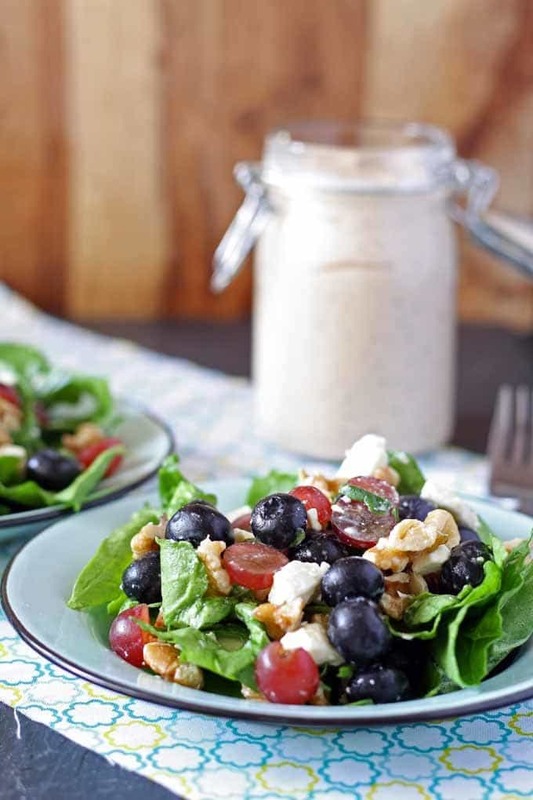 In a large bowl, combine the spinach, grapes, blueberries, walnuts and feta cheese. Spoon onto four plates and drizzle with salad dressing. 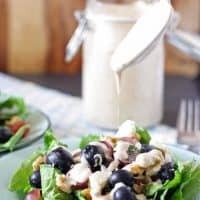 i love that this utilizes low fat mayo, i have been eating a ton of salads lately and this would be a great dressing to try!! This looks so good and healthy. I’m always looking for new salad recipes. 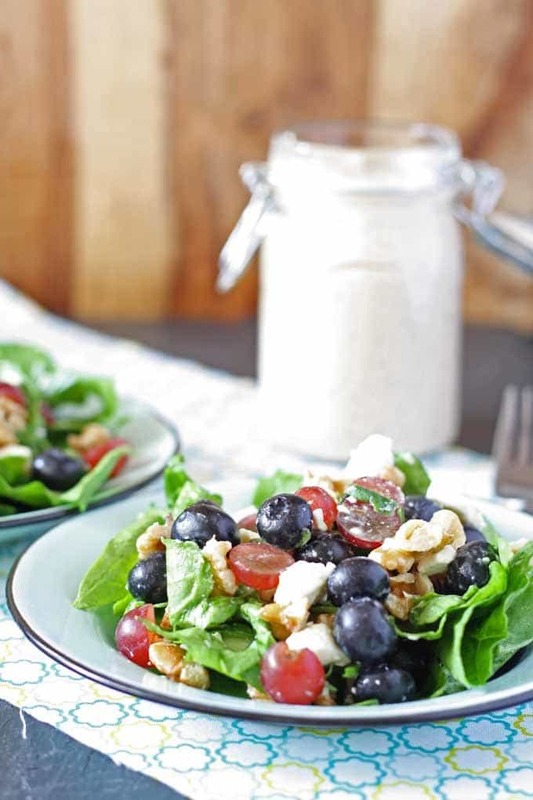 I never would have thought to put blueberries in my salad, but hey, why not. Thanks for sharing. I need to eat more salads because they are so healthy. This one look great! What a great looking salad. I am going to have to try this out as it has all of the ingredients I love. I have pinned it for future reference. Thanks for sharing this wonderful recipe. My wife loves balsamic vinegar dressing and would probably love this. i love everything about this simple but super yummy recipe! i am in love with salads thas has grapes plus the balsamic touch on the dressing must give it a unique taste.